MXGP World Champion Jeffrey Herlings ended his 2018 campaign aboard his KTM 450 SX-F, with his 17th victory of the year at Imola for the Grand Prix of Italy. 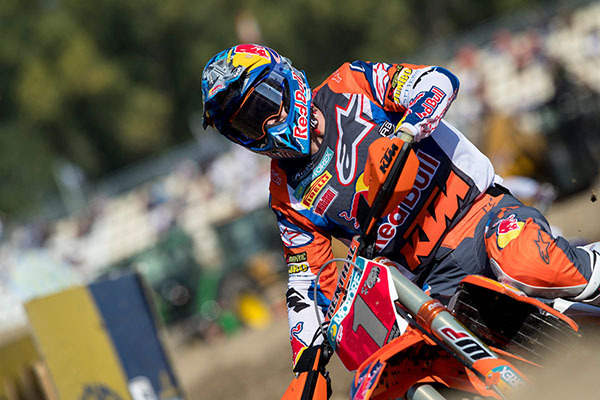 The final round of the FIM Motocross World Championship also saw Jorge Prado win for the second GP in a row and celebrate his first MX2 title aboard his KTM 250 SX-F.
Herlings was, once again, untouchable at the hard packed Imola circuit. On Saturday he won every session, taking the Qualification Heat victory for the thirteenth time this season. And on Sunday, the champion showed his superiority by taking both Moto chequered flags. Herlings has been head and shoulders above the rest competition all year long, describing his successful season he said "It has been a great experience, a great year and great memories. I especially want to thank my team. If you look to the statistics then it has been pretty unbelievable and almost an indescribable year. It will be hard to accomplish again I think." The icing on the cake for the KTM Factory Racing team came, when the Spanish sensation, Jorge Prado became one of the youngest ever FIM World Champions, after securing his 12th Grands Prix win of the season. Aboard his KTM 250 SX-F, the young spaniard easily won the Qualification Heat and on Sunday, infront of a raucous crowd, took both Moto wins. Herlings has pushed the limits of motocross all season long. Aboard the KTM 450 SX-F, time and time again he's found the extra power and handling ability to rise above the competition. KTM claimed that this is the fastest motocross ever built, and it only takes one look at Herlings' dominate 2018 record to realise they were telling the truth. The KTM 250 SX-F is light, agile and fast. Jorge Prado, at just seventeen years old was able to tame some of the world's most difficult circuits aboard this KTM machine. The bike inspires confidence. Even when you open the throttle, you feel in control. KTM's 2018 SX-F range has produced some special results this year. Two FIM World Champions and numerous age group champs have reaped the rewards of riding the best motocross bikes on the market. If you'd like to feel the the unrivalled performance of a KTM motocross bike, visit our showroom and see the range for yourself.